Shandong province is best known as the birthplace of two of the greatest philosophers in Chinese history: Confucius and Mencius. The province itself played a pivotal role in the establishment of Chinese civilisation along the Yellow River and is home to some of the most influential religious sites in the country. From the ancient Buddhist temples near Jinan to the lofty heights of sacred Mount Tai, Shandong’s historical and spiritual pedigree is undeniable. So, if you’re looking for enlightenment, you’ve come to the right place! The province itself can be roughly divided into two distinct segments: the inland zone and the Shandong Peninsula. Within the inland zone, the North China Plain was once home to a succession of Neolithic cultures, including the Houli (6500–5500 BC), the Beixin (5300–4100 BC), the Dawenkou (4100–2600 BC), the Longshan (3000–2000 BC), and the Yueshi (1900–1500 BC). Inscriptions found on clay pots that were unearthed at the Dawenkou site are believed to be the earliest examples of written language in the country! By the Spring and Autumn Period (c. 771-476 BC), Shandong had risen to become a centre for political and military activity. During the Warring States Period (c. 476-221 BC), it was separated into two autonomous territories: the State of Lu, where Confucius and Mencius originated from; and the State of Qi, which was the larger and more powerful of the two. Since the State of Qi controlled the Shandong Peninsula, it swiftly became an influential hub for early maritime trade. From the Han Dynasty (206 BC–220 AD) onwards, Shandong rose to become northern China’s focal maritime trading centre and was an indispensible contributor to the country’s development as an ancient civilisation. Yet it wasn’t just the Chinese imperials who understood the value of this coastal province. In 1897, German troops landed in Shandong and the German government eventually forced the Qing Dynasty (1644-1912) to sign a treaty that ceded access to Jiaozhou Bay and its islands. On top of this, Germany was also granted the right to construct a naval base in the city of Qingdao. Nowadays, this Germanic influence can be felt throughout the province and is particularly prevalent in Qingdao, where the internationally renowned Tsingtao Brewery is located. In fact, this link is so well-established that the Qingdao International Beer Festival is often referred to as Asia’s Oktoberfest! While the Shandong Peninsula is now famed for its spectacular beach resorts, the western part of the province is dominated by the North China Plain and the centre is characteristically hilly, culminating in the magnificent Mount Tai complex. This has resulted in two geographically diverse regions that are each served by different climates, oscillating between humid continental and humid subtropical. Temperatures in the inland zone average at a chilly −4 °C (25 °F) in winter, but rise to a comfortable 28 °C (82 °F) in summer. By contrast, winter temperatures along the peninsula rarely drop below 0 °C (32 °F), and summer temperatures average at around 26 °C (79 °F). With its geographical diversity, Shandong boasts attractions to suit every disposition! For the avid hiker, there’s the towering Mount Tai, one of China’s Five Great Mountains. According to the religion of Taoism, it is the most sacred site in the world and over 250 temples are scattered throughout its expanse. The mountain was deified as early as the Han Dynasty, and was made a UNESCO World Heritage Site in 1987. Alongside this spiritual behemoth, Mount Lao and Mount Kunyu also enjoy a venerable reputation as places of significant natural beauty. As the ancestral home of both Confucius and Mencius, it goes without saying that Shandong is a haven for the historically inclined! 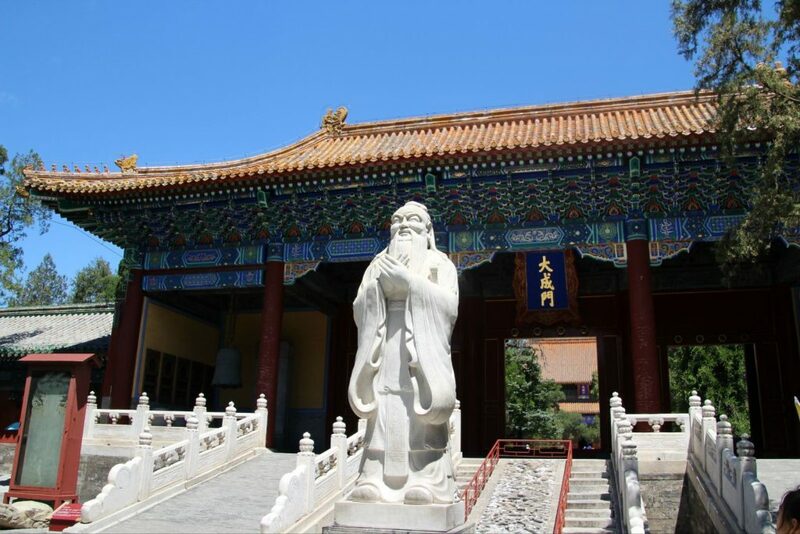 The Temple of Confucius, the Cemetery of Confucius, and the Kong Family Mansion are all located in the city of Qufu and were collectively designated a UNESCO World Heritage Site in 1994, while the temple and mansion of Mencius can be found in the city of Zoucheng. The province is also home to one of the oldest existing Great Walls in China: the Great Wall of Qi. It was originally built in 685 BC and many of its existing sections date back to 500 BC, making them over 2,000 years old! That being said, sometimes all you want is a bit of rest and relaxation! Tourists flock to the provincial capital of Jinan every year to visit its 72 Famous Hot Springs, while Qingdao and Penglai are heralded as some of the province’s finest beach resorts. Not to mention, Shandong-style cuisine is ranked as one of the Eight Great Culinary Traditions of Chinese Cooking, so you’ll be spoilt for choice when it comes to spoiling yourself!